Western States Honor Orchestra recordings due Tuesday. Application due Friday. See below for additional information. 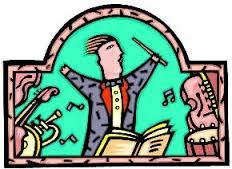 Please note: CMEA Honor Performance, January 26, 9am Broadmoor Hotel, Colorado Springs. We are severely lagging behind last year’s participation. 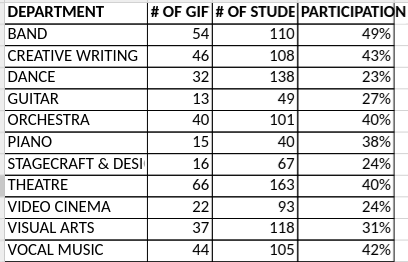 Below is a chart of participation by each major. We must meet the $600,000.00 funding goal so we do not have to trim back each departments allotment for artists. If we are not over the $525,000.00 mark by Friday, September 14th I will have to reduce each department’s funding for artists for the fall semester. DSA is tuition free, but donation dependent. 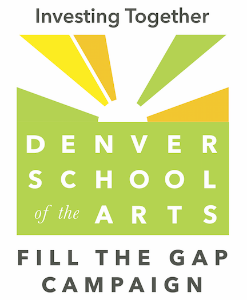 Because DSA gets no extra funding for the arts beyond our mill levy allocation, financial support from all families is required. Fill the Gap funds a wide variety of areas. While funds raised benefit every department, they also go towards academics, capital improvements, building safety/security, and technology. The gap this year is $1,380 which translates to $115 per month. Monthly donations are encouraged as a way to spread out this expense. Families are asked to participate at a level which fits their budget. This campaign benefits the entire school, not just your arts major. Thank you so much and contact me if you have any questions. This will not be an organized school-sponsored trip so parents will be responsible for travel, accommodation & chaperone arrangements per WSHO requirements. Please let Terrie Tyree (tyreeworld@centurylink.net) know if you are submitting a file to gain access to the Dropbox folder. Recordings must be submitted to WSHO dropbox by the end of the day on Tuesday, September 11th, 2018 so he has time to review the files before he has to submit files on Friday, September 14th. Complete and submit the online AUDITION APPLICATION prior to 4:00 pm on Friday, September 14, 2018. You will be required to pay a $30 application fee when you submit the form. Credit card and e-check payments will be accepted. Your high school orchestra director must request a Dropbox folder to submit your audition recording by emailing WSHOF@unco.edu. If you are a homeschooled student, your parent/guardian may request a folder. Students, please do not request a folder directly. Audition recordings (mp3 files only) must be submitted to your school’s Dropbox folder in the following format. All required audition material must be included in one file in the following order: Scales, Orchestral Excerpts, Solo Selection. Only one file including all audition requirements should be submitted per applicant. An announcement of the student name and instrument is NOT required at the beginning of the recording. Audition recordings must be recorded without accompaniment. Recordings must also be unedited with no added “overdubs” or reverb. Mp3 files must be compressed at a bitrate of no more than 256 kbps. Files larger than 20MB will not be accepted. Consider that the quality of the audition recording may reasonably affect the perception of the adjudicators. Links to the required audition materials are listed in the Resources Section. The recorded audition, completed application form and audition fee must be RECEIVED by 4:00 PM ON FRIDAY, SEPTEMBER 14, 2018. Any recordings or applications received after this date will not be eligible! Audition results will be posted to the WSHOF website by 5:00 pm on Friday, September 28th. We regret that we are unable to provide evaluations of each student, nor are we willing to repeat the process in order to possibly reconsider a student’s audition. All judges’ decisions are final. Each time you reload your King Soopers Reloadable Gift Card (must be purchased through DSAO for $2.50 â€“ which is the amount already loaded on the card), 5% of each reloading (up to $500) is awarded to DSAO, and we will track it for you and your student. That is 5 cents on every dollar you spend without costing you anything! Even a small amount can help when it comes time to pay for trips. King Soopers send DSAO a check each time the reloads reach $5,000 or more, and that is when your students travel account will be credited with the amount earned. There is no cash value attached to the account, it is for DSAO fundraising only. Funds may follow the student from year to year providing they stay in the Orchestra. 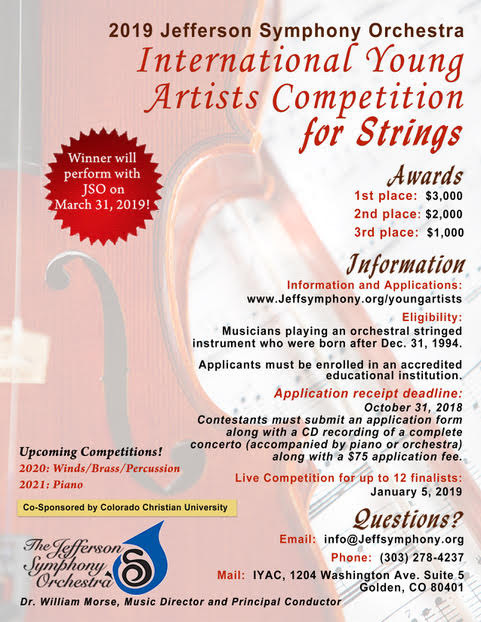 Once the student graduates, or leaves the Orchestra, the funds will be transferred to the DSAOtravel scholarship fund, or may be transferred to a sibling within the Orchestra. Funds are not issued to the departing student or family.